The United Nations is mobilising what it says will be its biggest relief operation ever in response to the Asian quake disaster. At least 23,000 people were killed - mostly from sea surges triggered by the worst earthquake in 40 years. Thousands are missing, millions are homeless, and the disaster zone is now threatened with outbreaks of disease. At least 10 countries have been affected, with Sri Lanka, Indonesia, India and Thailand among the worst hit. Countries around the world have pledged money, personnel and supplies to the international aid effort now getting under way. But the United Nations says it faces an unprecedented challenge in co-ordinating the distribution of aid to survivors. Hundreds of planes carrying emergency aid will be airborne within the next couple of days, the UN's emergency relief co-ordinator Jan Egeland said. Survivors may have little clean water or sanitation after Sunday's 9.0 magnitude earthquake sent huge waves from Malaysia to Africa. Many places are still affected by flooding and communications remain disrupted, with contact not yet made with some remote regions. Though it was not the biggest tsunami ever recorded, "the effects may be the biggest ever because many more people live in exposed areas than ever before", said Mr Egeland. He said the relief operation would probably cost "many billions of dollars". "However, we cannot fathom the cost of these poor societies and the nameless fishermen and fishing villages...that have just been wiped out," he said. Communities were swept away and homes engulfed by waves up to 10m high after the quake created a wall of water that sped across the oceans. Many of the victims had no warning. Fishermen were swept from boats, and tourists were washed from the beaches. Thai officials warn the death toll may double, to 2,000, after rescue workers found scenes of devastation in Khao Lak, north of the resort island of Phuket. Witnesses spoke of bodies strewn along the shoreline, and 500 staff and guests in one hotel alone were reported missing. Hundreds of spectators were believed to have drowned at a sports field in Aceh, northern Indonesia. The vice-president has warned that fatalities in the province, which is nearest to the quake's epicentre and among the worst hit, could rise as high as 25,000. In Sri Lanka, where authorities warn the death toll may rise to 20,000, a train carrying some 150 passengers was hurled off the track and submerged. Thousands are also feared to have been killed on the Andaman and Nicobar islands, where reports say several islands have been submerged. Waves also swept the Somali coastline after nightfall on Sunday, where hundreds are feared drowned and thousands made homeless, officials said. In Sri Lanka, about a million are now homeless. 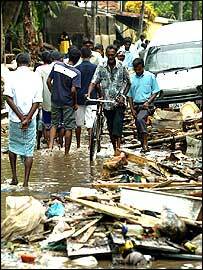 The BBC's Roland Buerk in the southern town of Galle says people all along the coast have been digging - for food, water, belongings - and the dead.